John Viljoen and his family save every drop of water for reuse. 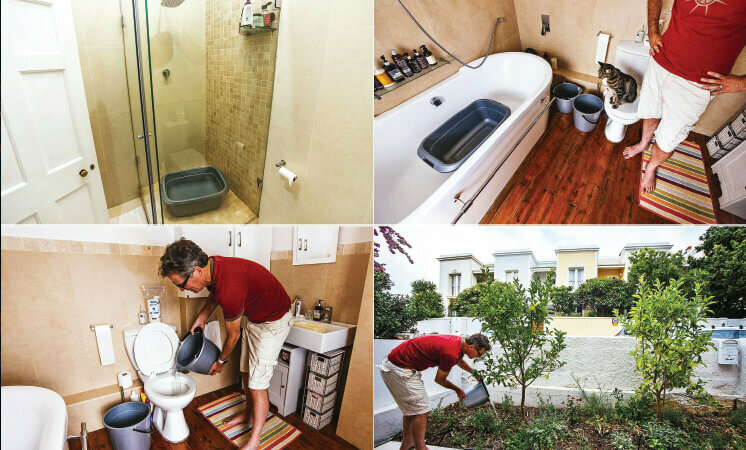 To shower in 90 seconds or less like a local in Cape Town, you need a plastic basin to stand in — a bucket is just going to lead to wastage — and, preferably, a hand-held shower. Capture any water you run before the shower reaches a decent temperature in your basin, then quickly wet yourself before turning off the faucet. Soap up and clean before turning on the water again. If it is a hair-washing day and you have not made the switch to dry shampoo, skip the “repeat” bit after rinsing. Irksome at first, these steps have become routine in recent months as we save and reuse every precious drop of water in our beautiful but parched home town. Capetonians have been told to keep daily water consumption to 50 litres a person. A long, luxurious bath can use four times that much. I am quite proud that in our household we have got it down to around 30 litres, with the water from those 90-second showers harvested in buckets and deployed for the toilet and to keep a few favourite plants alive. The last time my wife or I took a bath was three months ago, when we were abroad. Confronted by the worst drought on record after years of disastrously low rainfall, city authorities say they may have to turn off the water entirely by June 4, the latest estimation of “Day Zero,” if reservoir levels keep falling and consumption does not slow. That has sparked panic buying of water. Supermarkets have varying limits on how many 5-litre-bottles of water shoppers may buy — when there is any to be had. Friends have installed tanks to capture and store water on the rare occasions when it rains. Because we recently moved, we have been left behind on this front. A distributor I called last week said he had none in stock and the waiting list was so long that he would not even take an order. The small washing machines for campers that my wife has been coveting have all been snapped up — you can not get one anywhere in South Africa. Our family wash takes place once a week, on the 15-minute cycle. 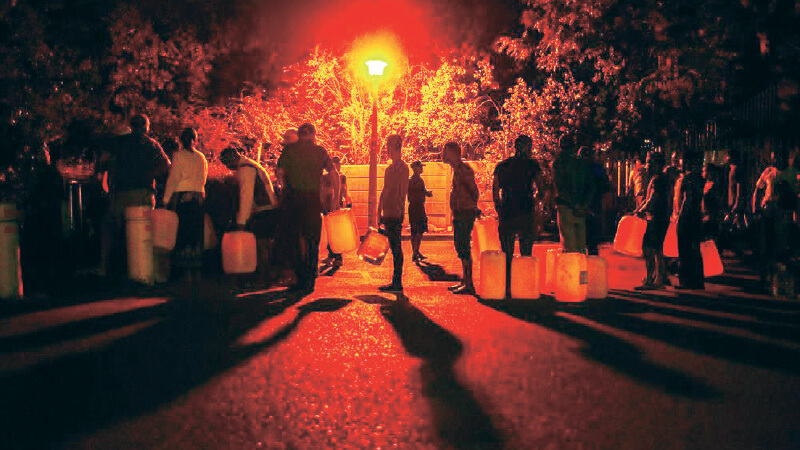 Residents are sharing pointers on how to live with the drought on social media, with the “Water Shedding Western Cape” Facebook group boasting more than 154,000 members. Advice dispensed in the forum in recent days includes dealing with kitchen drains that are turning smelly because of the little water flowing through them, and which supermarkets have those sought-after 5-litre-bottles in stock. Members of the group compare notes on how much water they have stockpiled — the results range from zero to 20,000 litres. There is handy guidance on how to build a system that gathers used water from your washing machine and the low-down on the latest rules on using water from boreholes, an increasingly popular option. The drought has devastated gardens, but boosted the popularity of fake grass. A lawyer friend is among those who have replaced their entire lawn with the verdant, artificial alternative. Our water crisis has driven invention and innovation: Two Bloomberg colleagues have invested in contraptions typically used to spray insecticide, but that are now catching on as high-pressured, water-efficient showering devices. My sister is about to start renovations and will use water from the swimming pool to mix cement, the city having forbidden the use of municipal supplies for this. My in-laws stand in long lines at the natural spring in the suburb of Newlands, clutching their outsize containers. And you do not even want to know about the measures being taken in homes and at schools when it comes to using the toilet. We are becoming worried about the potential for illness as the water shortage drags on.